Cortec VpCI-329 is a vapor corrosion inhibiting oil-based concentrate for use with lubricating, hydraulic, and preservation oils. VpCI-329 provides excellent protection in sheltered outdoor/indoor conditions. 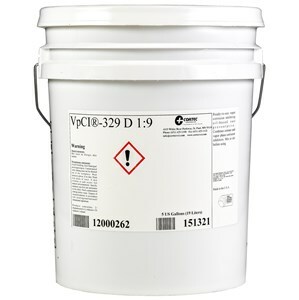 VpCI-329 protects in two unique ways by offering a tenacious film, which clings to metal surfaces as well as vapor phase inhibitors into the air above the oil. The vapors condense and form a protective barrier on metal surfaces that are not in contact with the oil. This combination allows complete protection to internal system parts. Short-term protection: One part VpCI-329 to 20 parts oil. Medium-term protection: One part VpCI-329 to 10 parts oil. Long-term protection: One part VpCI-329 to 5 parts oil. Storing metal parts: Spray, dip or brush VpCI-329 onto metal parts before storage. Storage for lubricating, hydraulic and metal cutting systems: Add Cortec VpCI-329 to oil in engines before storage. For best results, add VpCI-329 to the oil, then cycle or run the engine for 10 minutes before shutdown. After storage, the engine can be normally operated. There is no need to remove VpCI-329 from an operating engine. Available in 5 gallon plastic pails (Cortec Product # 12100031) or 55 gallon metal drums (Cortec Product # 12100032). 5 gallon drum weighs 50 pounds and ships under our standard shipping rates. The 55 gallon drum must be shipped by truck. We will provide you with a freight quote before we ship this product. VpCI-329 should be sealed before storage. Agitate before each use. The shelf life of VpCI-329 is up to 24 months.